Emitter Tubing works like a soaker hose - only better! It water evenly from beginning to end. 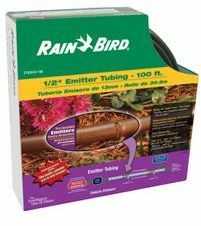 It won't clog and connects easily to your faucet, garden hose or existing underground sprinkler head. This product is available in 1/4" x 50'. See the table below for options. Emitter Tubing works like a soaker hose - only better!